The Reliance saga could finally be reaching its climax. According to a news story published in the latest issue of Businessworld, ICICI CEO K V Kamath may have succeeded in brokering a deal between the two Ambani brothers --�Anil and Mukesh. Kamath, who is acting as an arbitrator in the dispute, has prepared his final report, which suggests a way to carve up the empire between the two. The brothers are expected to present it to their mother Kokilaben Ambani in the next few days. Over the last couple of days, Kamath has had several rounds of meetings with the two Ambani brothers at his Bandra Kurla Complex headquarters in Mumbai, sometimes separately with each one and also together. According to the terms of the division, Anil will now get to run Reliance Energy and Reliance Capital. Additionally, he will also be given the petrochemicals business of Reliance Industries. It is expected that the petrochemicals business of RIL would be hived-off and merged into IPCL, which will then be managed by Anil. Mukesh, on the other hand, will get the oil and gas business of RIL and also continue to run Infocomm. On the face of it, the division appears equitable. 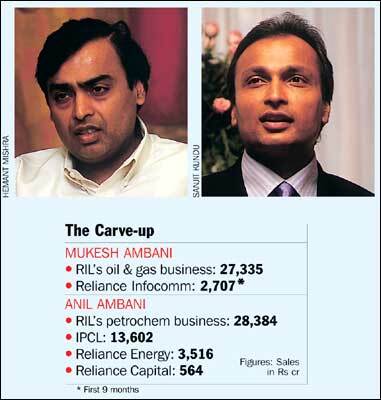 Before Reliance Petroleum was merged with Reliance Industries in 2000-01, both the businesses were almost of the same size. So what Kamath has apparently now recommended is to once again split RIL into two -- giving the brothers a mutually acceptable share of the company. This way, he has also allowed each brother to retain the businesses they had initiated. For example, Anil gets to keep the two businesses -- Reliance Capital and Reliance Energy -- which he had initiated, while Mukesh gets to keep Infocomm. If the final settlement finally proves acceptable to the brothers, it would mean that Mukesh is now willing to climb down from his original stand of not splitting RIL. Sub: Sad to see that happening in RIL! 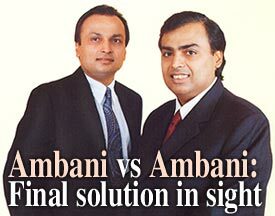 Sub: Reliance carve up logic..